If you’re seriously into bikes then one of the highlights of the events calendar is the Rouleur Classic. This London show is a humongous homage to the best the two-wheeled world has to offer, including what’s hot right now and future innovations on the way. Billed as "‘the world’s finest road cycling exhibition", the 2018 annual event ran from November 1-3, and was so popular the first day was completely sold out. That’s hardly surprising as show goers got the chance to rub shoulders with many of the finest riders in the world of cycling. They were also able to feast their eyes on not only the bikes, but also a wealth of accessories and clothing that go hand-in-hand with the machines themselves. Here’s a look back at a few of our favorites from this year. Fed up with clunky, oily conventional chains? Well, the CeramicSpeed Driven bike might be the solution, which lets you dispense with the usual derailleurs and chains found on traditional bicycles. This exciting innovation is a shaft-drive that engages with the front chainring, thereby replacing the normal teeth. CeramicSpeed reckons it creates 49% less friction than chain link systems. Adding to the efficiency boost is a collection of 21 hybrid bearings that are 58% lighter and 2.3 times harder than traditional steel counterparts. The bearings transfer torque from the front ring through the drive shaft, then onto a 13-speed rear cog. The Fuoripista is a completely off-the-wall design that takes fitness training into another dimension. 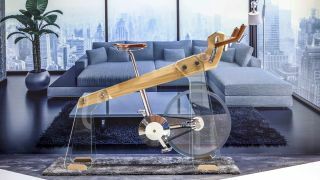 While it does look more like a work of art, this stationary bike features an integrated power meter, a virtual shifter and is crafted from a combination of wood, glass and aluminium alloy. The front-mounted tablet lets you virtually ride the best cycling routes around the globe too, although that doesn’t actually come included. Elsewhere, the Specialized S-Works Shiv is a brand new model from this well-respected bike builder that is aimed firmly at triathlon competitors. It features a FACT 11r carbon frame, Shimano Dura-Ace Di2 build kit and Roval CLX 60 wheelset. There’s a built-in hydration system, Sitero saddle and a host of carbon components, including the crank, meaning that the two-wheeler is light and highly manoeuvrable. If you’re a competitive type and looking to improve your performance then the Encapsulator Suit from Endura’s Aero collection looks ideal. At £429.99 (about $560, AU$780) it doesn’t come cheap, but has been hand-sewn in Scotland and uses a multi-fabric construction that includes Surface Silicone Topography sleeve and flank panels that boost its wind tunnel-tested aerodynamic properties. Staying with the accessories, the Gore C7 Gore-Tex Shakedry stretch jacket is the ideal garment if you’re hitting the highway and want to fend off the worst the elements has to throw your way. It’s beautifully sculpted, is light as a feather and boasts an ergonomically shaped collar. There’s a reflective logo for better visibility too. Back to bikes again and the Cervelo S5 is not only a thing of beauty, it’s built for speed with an aerodynamic design that delivers excellent road-racing performance. Integrated cables, a custom handlebar design and lots of tweaks in the structure of the frame and other components means that you’ll soon leave anyone chasing your tail way behind. Zipp’s 30th Anniversary Super-9 Carbon Clincher Discs are also designed with performance in mind. While they’re perhaps most noticeable due to their flamboyant colour schemes, these disc wheels feature heat-resistant resin-based materials that have been proven in the world of motorsports. Meanwhile, powerful and abundant braking is supplied thanks to the innovative design, which means that these discs are some of the most efficient on the market. On a final accessories note, the arrival of the Hexo is timely. It’s going to be the worlds’ first 3D printed fully custom-made bike helmet. Instead of foam, a substance used by all other helmet brands, it calls upon renewable polyamide that is 68% better at absorbing impact and conducts heat better than foam. A 3D scan is taken of the riders’ head, down to a 30,000-point accuracy, so each helmet is unique to each rider. It’s been developed by engineers from the University of Oxford and University College London, and will hit the shelves in spring of next year.